#1 Extraordinary speed and effortless acceleration are trademarks of the Corsair Trimarans. Their ability to fly on a puff or generate their own high-power apparent wind is legendary. 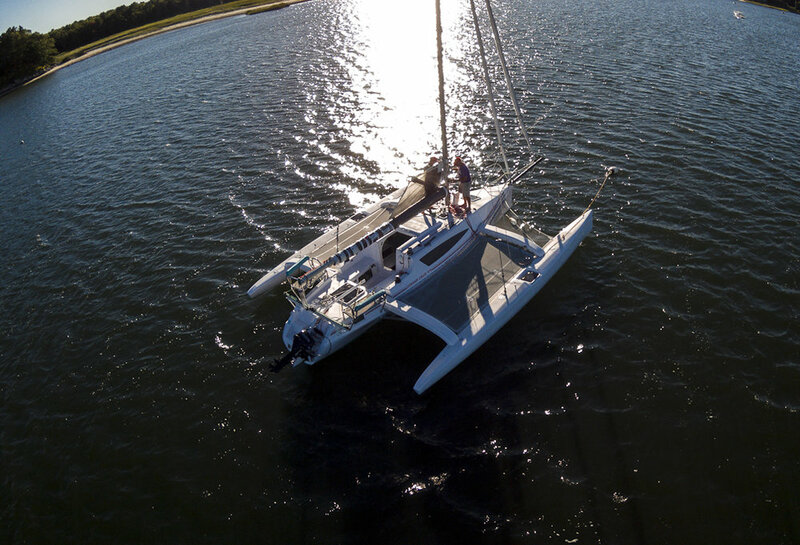 Without a lead keel to create drag, and with tangible buoyancy in construction technique and materials, Corsairs are powered effortlessly by their high-performance design. Below is the Corsair Cruze 970. #2 Superior safety is inherent in the design and construction of these boats and it stems from the same features that make them sail flat and fast. Corsairs can’t sink. In fact, with the hulls filled to the brim with water, the positive buoyancy of the materials of construction keep the vessel afloat even with all crew aboard. Below is the Corsair 760 Sport. #3 Comfortable stability at any speed and in almost all sea conditions is simply a feature of wide beam and buoyancy. 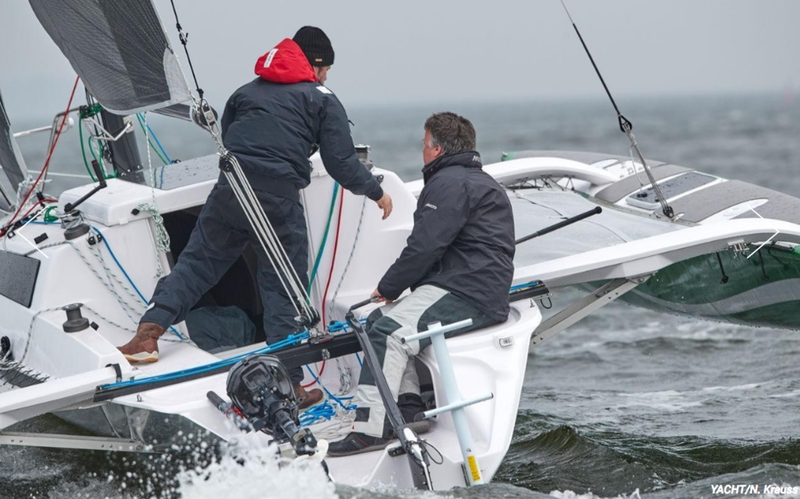 Heeling (often unpopular with sailors) is restricted to about 15 degrees, which feels like about 5 degrees on the broad, flat deck and trampolines of a Corsair Trimaran. Below is the Corsair Cruze 970. #4 Trailerability is not a hassle. It’s an advantage! Especially since it only takes a single owner about 60 minutes to go from trailer to sailor and back again after a couple of practice runs. Corsairs fold up and extend effortlessly, the mast comes down in moments, the boats tow easily and smoothly and the design saves you a bundle on slip fees and seasonal storage. Below is the Corsair 760. #5 Accommodations are ample and designed for extended cruising aboard the larger models or streamlined for racing on all models. Berth areas are sufficient and comfortable, appliances are an option and many models offer a shower if you want one. You’re apt to lounge on deck or in the cockpit most of the time but when you do go below you’ll have the comfort you need. Below is an interior pic of the Corsair 760. #6 BeachAbility! On a Corsair, you can sail or motor up to the beach, step off and drop anchor on land, you can see if it is set properly! No need to load up the dinghy as everything is with you aboard and nearby. Below is the Corsair Dash 750 MKII. #7 Unparalleled construction. We do not compromise on materials or technique of construction. Corsair has pioneered high strength and lightweight construction technology that incorporates aerospace composite, foam sandwich construction, glass fabrics, carbon fiber, kevlar unidirectional and vacuum bagging for an ideal glass to resin ratio. #8 The folding system. It’s spectacular. It’s patented. After decades of use worldwide our folding systems are well proven and are the most successful and structurally sound available for trimarans. Below is the Corsair 760 Sport. # 9 Venerable design. Our exceptional Corsair design teams have demonstrated an unsurpassed ability to accommodate innovations to sail plans, interior modifications and accessory additions that Corsair owners have requested resulting in a line of performance sailboats offering as much or as little as the people who sail them need and want. Below is the new interior on a Corsair Cruze 970. #10 Low Maintenance. The combination of engineering and materials that make Corsairs so strong, sleek, fast and lightweight also make them incredibly easy to maintain. And, as Corsairs are seldom stored on the water, there is little need for everything from bottom coatings to anti-mildew sprays. Below is the new Corsair Cruze 970. # 11 High re-sale value! Way past the time you’ll start taking your Corsair’s strength, endurance, dependability, fit and finish for granted and believe that other boats must also be built as well because how could anyone settle for less – you’ll probably start seeing some new Corsair model and think about trading up. That’s when you’ll find out that the superior construction of your Corsair will enable you to sell it to someone else for not much less than what you bought it for new. Below is the Corsair 37. #12 Our global dealer network means you have support when you need it whether it be parts, service or advice. All new boats come with a 5 year structural warranty and your nearest dealer will be able to help you when you need it and even if you don’t. #14 Throughout the years Corsair has been reliable. We offer consistency in the products we offer which is tied to the strong Corsair Marine brand name. #15 Through our shipwrights, management team, production team, dealers and our fleet captains we share a passion for delivering great products and the information that enables you to get out there and enjoy your boat! #16 Finally, the way they look and make you feel: fast, sleek and unstoppable.